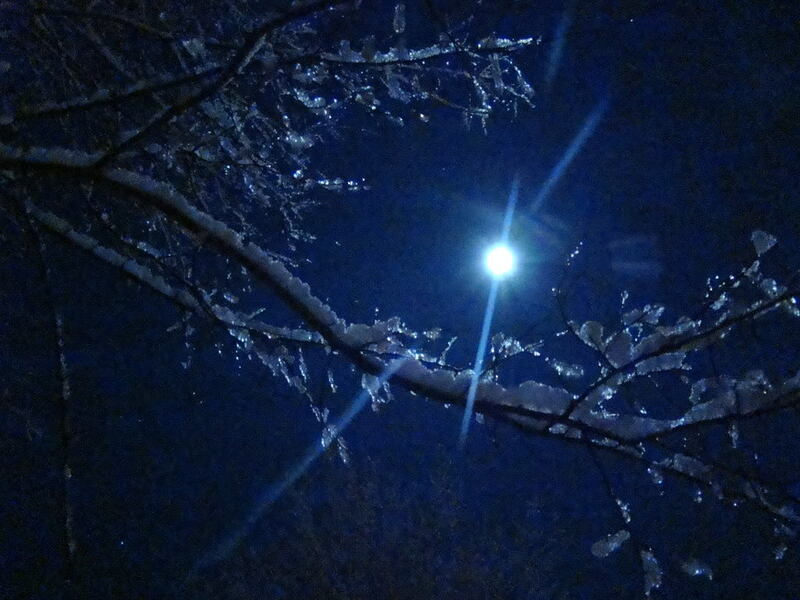 Coleridge's 'Frost at Midnight', written in February 1798, is one of his most celebrated poems. And rightly so, since I can't think of another poem as beautifully evocative of midnight silence: the solitude of the poet by the low-burning fire whilst all the other inhabitants of his house are asleep; his baby asleep in his cot beside him. Coleridge ponders what the future holds for his son, Hartley, and undertakes to raise him right. In the event, Hartley's upbringing wasn't something Coleridge could take a whole lot of credit for; but his heart is in the right place, here. In other words, this is a poem about fatherhood. It is also a poem in which the silence, the 'secret ministry' of the frost outside, and the film of fire over the burning coals—known colloquially as a 'stranger', since it is supposed to portend the arrival of an unexpected visitor—all send Coleridge back in reminiscence to his own childhood, and in particular to his unhappy experiences as a boarder at his London school, Christ's Hospital. That unhappiness is epitomised by the vignette of the boy-Coleridge, told what the fire-film of the 'stranger' on the school fire is supposed to mean, looking up expectantly for his visitor, hoping that it would be somebody from home to take him away. The final section of the poem performs Coleridge's promise to baby Hartley that he will be raised in the countryside, close to the spiritual and healthful influence of Nature, and not sent away to the city as Coleridge himself was. There's something so exquisite in the way the final image of the poem brings us back to the mystic-silent frost and moonlight of the opening lines that it's hard to read without shivers going up the back of the neck. Came loud–and hark, again! loud as before. Hartley will ‘see and hear’ [line 58] God’s eternal language in all seasons … There in an ambivalence in his gesture of blessing, since it is others who read nature’s language. In the final version of ‘Frost at Midnight’ Coleridge returns to the ‘deep calm’  on the winter midnight, but in an earlier version he returned to the ‘dead calm’, a troubling indication that Hartley’s role is not simply that of a second self, but of someone granted a blessing that Coleridge cannot share. It's astute of Magnuson, I think, to recognise the extent to which this poem records not harmony so much as a sort of chasm existing between Coleridge and his son. Indeed, the verse's calmness of tone is a little baffling: is it the deep peacefulness of a contented spirit, or the blankness of a despairing soul who has, even if only temporarily, accepted his hopelessness, and deferred hope onto the life of his son? We all know what hope deferred maketh of the heart. So: a poem about fatherhood and sonhood, and it takes its starting point in religiously-inflected thoughts about a frost, at midnight. Since the poem so clearly, even ostentatiously, indicates that this is a matter of specific personal observation (Coleridge actually sitting in his cottage at midnight, actually watching the fire, actually peering through the window at the frost outside) it might look perverse to pursue a literary source. Nonetheless that's what I'm going to do. Die aestu consumebar et nocte gelu, fugiebatque somnus ab oculis meis. Here's the KJV's translation: 'Thus I was; in the day the drought consumed me, and the frost by night; and my sleep departed from mine eyes', which I'm going to tweak, without departing from the meaning of the Latin (and I daresay the original Hebrew), to emphasise my point: 'Thus I was: in the day the drought consumed me, and the frost at midnight; and my sleep departed from mine eyes'. 40 Thus I was; in the day the drought consumed me, and the frost at midnight; and my sleep departed from mine eyes. The encounter ends well: Jacob builds a pillar out of stones as a kind of altar (he says to his uncle '"Now therefore come thou, let us make a covenant, I and thou; and let it be for a witness between me and thee." And Jacob took a stone, and set it up for a pillar'). Laban goes back home and Jacob goes on to his destiny, which is to change his name to Israel and become the father of the twelve tribes. In the Genesis passage the frost at midnight is an affliction Jacob has had to undergo, rather than an environment that prompts Laban to thought (although I suppose we might say that Jacob bringing it to Laban's attention makes him think about it). I wonder if the parching 'heat at the daytime' is in some sense behind Coleridge's first, slightly wrong-footing remembrance of his childhood 'hot Fair-day' which is almost immediately replaced by his later memory of boarding in London at Christ's Hospital? And I wonder if the heap of coals in his grate is connected in some sense with the heap of stones Jacob assembles as correlative to his covenant with Laban: 'And Jacob said unto his brethren, Gather stones; and they took stones, and made an heap ... And Laban said to Jacob, Behold this heap, and behold this pillar, which I have cast betwixt me and thee; This heap be witness, and this pillar be witness, that I will not pass over this heap to thee, and that thou shalt not pass over this heap and this pillar unto me, for harm' [Genesis 31:46-52]. It is, in other words, the heap of stones that establishes the principle of 'being strangers' as a guarantee of no harm. And when Coleridge imagines Hartley wandering 'beneath the crags/Of ancient mountain' [60-61], a rather oddly singular mountain, is he on some level thinking of Gilead, the mountain at the foot of which Laban and Jacob reconciled and made their covenant? Gilead in Hebrew means both the 'eternal joy' of God and the 'eternal stone' or 'eternal memorial'. That might be why Coleridge's otherwise unnamed mountain embodies 'the lovely shapes and sounds intelligible/Of that eternal language, which thy God/Utters, who from eternity doth teach/Himself in all, and all things in himself'. Sam 'Metal' Taylor Coleridge. Image courtesy of @keatsandchapman. Click the image for context. One of the most june men in all the Russias. 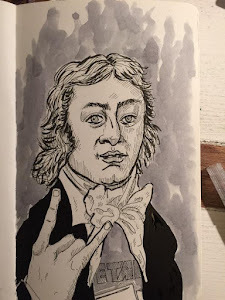 This blog is by way of being a commonplace book and notepad for my work on Samuel Taylor Coleridge. I began it when I was making this edition of the Biographia Literaria. In 2015 I was mostly working on this edition of Coleridge's Lectures on Shakespeare. In 2018 the focus of the blog is more to do with Coleridge's relationship to Latin and Greek, and especially to Latin.